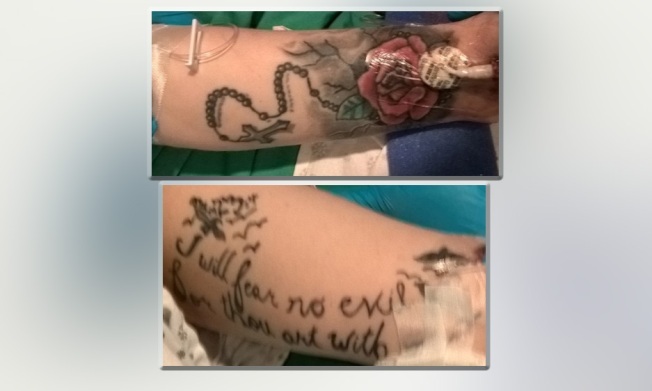 Police released these photos of the unidentified woman's tattoos. An unconscious woman was found along a Bronx roadway and police are asking for the public's help to identify her. The NYPD on Saturday released photos of tattoos on the woman's arms. The woman is hospitalized in critical condition at Jacobi Medical Center, police said. She was found at about 9 p.m. Friday near the entrance ramp from Pelham Parkway heading into Interstate 95, investigators said. The tattoo on the woman's left arm depicts a rosary and a rose. Her other arm bears the words: "I will fear no evil for thou art with." Anyone with information about the woman is asked to call the NYPD Crime Stoppers Hotline at 888-577-TIPS.